Available All-Wheel-Drive (AWD) system helps to provide added traction on snow, ice and other low-traction surfaces. With available seven-passenger seating, everyone can ride in comfort. ParkView Rear Back Up Camera helps with parallel parking, backing out of parking spaces. 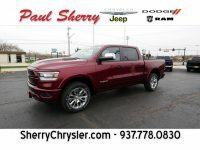 Always find the lowest prices at Paul Sherry.